NAB Show update: An 80% showing. by Jay Mitchell • March 27, 2018 • Comments Off on NAB Show update: An 80% showing. 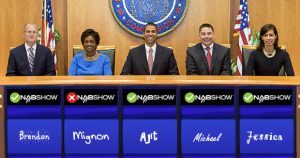 Four of the five FCC commissioners are slated to appear at the NAB Show in Las Vegas in a couple of weeks. (The only holdout is Mignon Clyburn.) Chairman Pai is scheduled to speak at the “We are Broadcasters Celebration” dinner on Tuesday, April 10; Commissioners O’Rielly, Rosenworcel, and Carr will be appearing in separate sessions.